Bumper Jacksons. Courtesy of Bumper Jacksons. Bumper Jacksons performing "Take Me Back to Tulsa"
So anyway, take my advice and listen to Too Big World! You may come for the jazz: clarinet and horns and swingy rhythms, plus Billie Holliday and Duke Ellington classics. But you'll stay for all the other ingredients in their mélange: fiddles and guitars, bouncy banjo-ukes, weepy country pedal steel, rock-and-roll electric guitar, jug-band kazoo and assorted percussion. You'll enjoy their eclectic repertoire of Gold Rush laments ("The Dying Californian"), sad old-time love lyrics, ("Virginia Girls"), and Kentucky play-party songs ("Jubilee"), all neatly arranged and sweetly played. You'll be charmed by the bohemian quality of their originals, which celebrate cups of joe ("Coffee Mama"), shattered dreams ("Adventure Story") and even Washinton, D.C.'s Idle Time Books ("Pretty Mama Put a Spell on Me"). And since no Americana album is complete without Jesus and the Devil, this one features the gut-busting gospel of "Satan, Your Kingdom Must Come Down" and an infernally infectious tour of the afterlife called "Hell is Hot." You mark my words, their hellacious devil music will make you get up and dance! You can preview the album here. And check out another video below! I may have spoken too soon about the Jesus and Devil thing, because there's none of that on Grant Dermody's latest album Sun Might Shine on Me, and his press material speaks a lot about Tibetan Buddhism. Dermody, a harmonica player who has worked with blues giants like John Cephas, Phil Wiggins, and Honeyboy Edwards, says that Buddhism and the Blues are both about diving underneath pain or hard times, so they don't take you over; about feeling better, not feeling sad. On the new CD, his harmonica and voice lead an all-star ensemble including old-time and Cajun guitarist Dirk Powell, Louisiana Creole fiddler Cedric Watson, blues mandolinist Rich del Grosso, folk and blues guitarist Orville Johnson, and swamp-pop drummer Jockey Etienne. They're all masters and their playing hangs together beautifully, creating perfect settings for Dermody's harp and voice. His soulful harp work on classics like Skip James's "Illinois Blues," the traditional "When You Left," and the original "Ain't Going Back" reminds me of his mentor Phil Wiggins. His voice goes from a gravelly growl to a clear, tuneful croon -- would it be sacrilege to say it reminds me in some places of Sinatra? My favorites include "Baby Please Don't Go," a song I've heard from tons of folks including Van Morrison and Them, Muddy Waters, Lightnin' Hopkins, and Big Joe Williams; "Tree of Life," an original instrumental that sounds like an Irish folk tune with blues touches; and the upbeat title track. I also love the traditional folk material, including the epic blues ballad "Boll Weevil," a Creolized version of "Sail Away Ladies," and an instrumental version of the Cajun lost love anthem "J'ai Passé Devant Ta Porte." Dermody has a knack for feeling out the material and creating heartfelt settings, and his band and producers made it shine indeed. See the video below! Lately, a few intrepid performers have been reclaiming the old term "songster," a category of singer-musician common in the 19th and 20th centuries. Largely but not entirely African-American, songsters were popular entertainers with a broad repertoire including blues, ballads, spirituals, parlor songs, dance tunes, and whatever else they could learn or write. Some were street-singers, vagabonds, or wanderers, but others were homebodies who played for their local folks in their own homes and communities. They were the Americana artists of their time, you might say. Famous songsters included Lead Belly and Gus Cannon (the wandering kind), as well as Mississippi John Hurt and Mance Lipscomb (the homebody kind). This new generation's most famous songster is probably Dom Flemons, whom I discussed last time. But there are others, including Ben Hunter and Joe Seamons, whose album Take Yo Time expresses their philosophy: "Blues and folk songs do not need preserving -- they are preserving us. 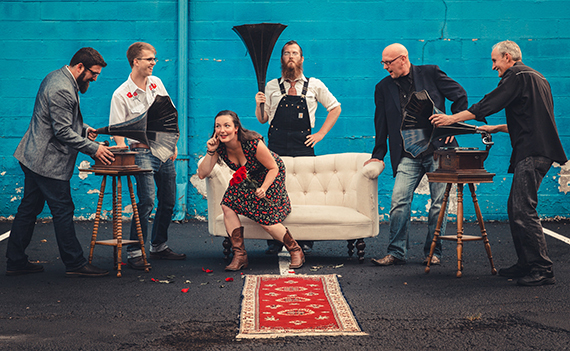 Our mission is to spread the glory and whimsy of traditional song." And so they do, with an engaging presentation on banjo, fiddle, guitar, and voice, of pieces from such varied sources as Barbecue Bob, Duke Ellington, and Clarence Ashley. Ben Hunter and Joe Seamons. Photo by Amber Zbitnoff. Courtesy of KEXP and Hunter & Seamons. Memorable moments on Take Yo Time include the plaintive banjo and knee-percussion on "Some of These Days"; the dejected-sounding bent notes on "Broke Down Engine Blues"; and the defiantly unusual take on "Preachin' Blues," featuring just atmospheric fiddle, rhythmic banjo, and swooping vocals. I like a lot of their decisions: tasteful double-stopped fiddle opens their version of "Tom Dooley," lending an almost Creole touch to the old North Carolina murder ballad; subtle bones-playing graces the Rev. Gary Davis piece "Banks of the River," adding just the right seasoning; and the guitar and fiddle both playing on Big Bill Broonzy's "Long Tall Mama" reminded me that Broonzy was a fiddler, too. I love how the duo's similar takes on "Buck Rag," another Gary Davis guitar piece, and "Beaumont Rag" the Bob Wills classic, underscore the common roots of our best traditional music, Western and Eastern, rural and urban, black and white. I especially like that these artistic decisions feel natural and serve the songs beautifully; they evoke strong meanings and invite contemplation, but at heart they're instinctive moves brought about by love of the material. 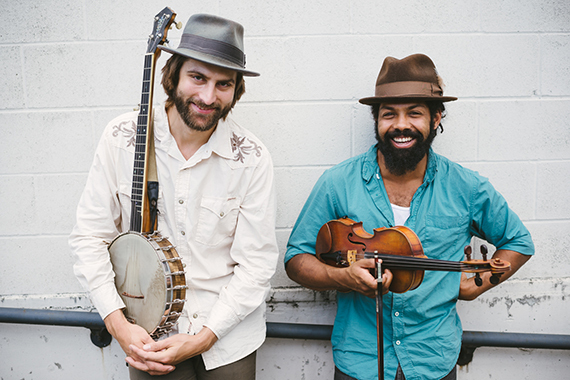 They indicate that, as Seamons and Hunter put it, "American roots music is our playground." Long may these songsters play! See an extended performance in the video below. Ben Hunter & Joe Seamons Live on KEXP, recorded August 19, 2014. Devil in the Seat is the 8th album from veteran quartet The Foghorn Stringband, which is made up of Caleb Klauder (mandolin, fiddle, vocals) Stephen 'Sammy' Lind (fiddle, banjo, vocals) Reeb Willms (guitar, vocals) and Nadine Landry (upright bass, vocals). Hailing from the Northwest (two from Oregon and two from Yukon), they play rural music from all over the country, and even some from overseas. The fact that they have four strong singers, two men and two women, gives them a lot of arranging options, and they take advantage of this on Devil in the Seat. They perform "Mining Camp Blues" with dual yodeling women's voices, and the English song "What Will We Do" in slightly edgier female harmonies than English divas Maddy Prior and June Tabor, from whom they learned it. On the other hand, they pull out tougher male harmonies on the crime-and-punishment ballad "John Hardy," and use the contrast between male and female voices on "Longing for a Home" to suggest the universality of homelessness and loneliness. There's some fun symmetry in certain of the songs too, from the thematic connection of "Columbus Stockade Blues" and the instrumental "Jailbreak" to the ghoulish balance of "Pretty Polly" and "Henry Lee," respectively a "boy-kills-girl" and a "girl-kills-boy" ballad. Mostly, though, there's the straightforward sound of powerful old-time sawing, plucking, strumming, and picking, in perfect synch and perfect harmony. It's simple but effective, and more fun than a night in the still-house drinkin' that cider! Watch a video below! The Foghorn Stringband peforms "Columbus Stockade Blues"
I'll end with a recommendation for the album Rugby, VA by Wayne and Max Henderson. Wayne Henderson is a world-renowned luthier as well as a master guitar player. He's built guitars for Clapton and repaired them for Elvis. He's also an old-time fingerpicking guitarist, and was awarded an NEA National Heritage Fellowship in 1995, the highest award given to a traditional artist. He even has a music festival named for him! Wayne originally learned to play chords from his older brother Max, who now suffers from memory loss and can't play music anymore. But twenty years ago, with Wayne on guitar and Max on mandolin, they recorded a set of pure unadulterated string tunes, which remains the only known recording of the Henderson brothers. Although it's got a few fiddle tunes, it's interesting for being mostly instrumental versions of songs, such as "Banks of the Ohio," "Will the Circle Be Unbroken," "Wayfaring Stranger," and "Cindy." You won't find a better or more authentic example of old-time music on guitar and mandolin. Released on the Music Maker Relief Foundation label, it will forever stand a great source of pure traditional music, and an enjoyable listen to boot. Watch a video about Wayne's guitar career below.